I’ve mentioned before on this blog that I was absolutely terrible at science in school which ended any notion of my becoming a doctor. Although truthfully I wanted to play a doctor, preferably on a daytime soap, more than I actually wanted to be one. The smell of formaldehyde still brings back memories of 7th grade science class when we had to dissect frogs and a fish (my mother had to help me with that one on parent’s day). I took four years of biology in high school more to avoid taking chemistry than from any real interest. Despite my obvious lack of aptitude for both science and mathematics, I find women who choose science or math as careers endlessly intriguing. As recently as a few years ago, the President of Harvard University got into hot water for implying that the under-representation of women in science and engineering could be due to a "different availability of aptitude at the high end," and less to patterns of discrimination and socialization.. And in the 19th century, for a time, it was thought that higher education would ruin a woman’s ability to conceive. Certainly, women making their way in mathematics and science had a hard fight ahead of them. Pioneers such as Elizabeth Blackwell, Marie Curie, Ada, Countess of Lovelace, and Maria Mitchell are amongst a host of other women who pushed the boundaries which paved the way for Rosalind Franklin in the 20th Century to do the pioneering work that she did with DNA and RNA in the 1950’s. If you haven’t heard of Rosalind Franklin, don’t worry, you are not alone. I had never heard of her either until I stumbled upon the NOVA program The Secret of Photo 51 a few years ago. The program detailed the race to discover how DNA worked and the role that Rosalind Franklin played. It was Rosalind who painstakingly conceived of and captured "Photo 51" of the "B" form of DNA in 1952 while at King's College in London. This photograph, acquired after 100 hours of X-ray exposure, revealed the structure of DNA. You could say that the discovery of the structure of DNA was the single most important advance of modern biology in the 20th century. Working at Cambridge University, James Watson and Francis Crick used Photo 51 as the basis for their model of DNA that culminated in their Nobel Prize in 1962. But when the time came for them to accept their award, very little mention was made of Rosalind Franklin. She couldn’t have been considered for the prize because she died in 1958 and the Nobel Prize cannot be award posthumously. It wasn’t until James Watson wrote his book The Double Helix in 1968 that the world at large learned of the important role that Rosalind Franklin had played. The portrait that he painted of Rosalind, who he disdainfully called ‘that dreadful Rosy’, a nickname that her friends never used, was not one that any of her friends or colleagues recognized. He focused on external things; the fact that she didn’t wear make-up, that her hair was not always groomed, but worst of all, he wrote that she had no idea how to interpret her own data (He’s since added a new epilogue to later editions of the book in which he acknowledges her talent as a scientist, his excuse is that the race to discover the structure of DNA clouded his judgment of her). The one good thing to come out of the book was that it inspired Anne Sayre to write the first full-length biography of Rosalind Franklin. 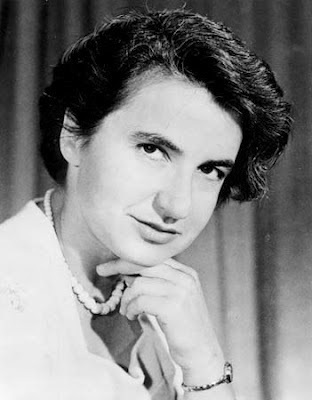 Rosalind Franklin was born on July 25, 1920 in Notting Hill, London. The First World War was over, women had just gotten the vote, and the Roaring Twenties was just about to start. Her parents both came from affluent Jewish families who encouraged their children not only towards academic excellence but also towards being socially conscious. The family was close-knit; evenings were spent in lively debate at which Rosalind excelled. From childhood, Rosalind was strong willed and independent. However, even they were surprised when Rosalind made the decision to become a scientist at the age of 15. She attended the rigorously academic St. Paul’s School for Girls where she became interested in physics and chemistry. She was not just gifted academically but also athletically, one of those girls who were good at practically everything. Although her father had encouraged her academically, when she expressed her desire to go to university, he was opposed. He felt that higher education was useless for women, and that Rosalind should spend her time doing volunteer work. Rosalind was not to be deterred. One of her aunts agreed to pay her tuition, and her mother supported her. Finally her father came around, and agreed to pay for college. At Newnham College (the second of the two women’s colleges founded in 1871), Cambridge she earned a degree in natural sciences with a speciality in physical chemistry. During the war, Rosalind did graduate work with the British Coal Utilization Research Association. That worked earned her a PhD from Cambridge at the tender age of 25. After the war, Rosalind moved to Paris to work for the Centre Nationale de la Recherche Scientifique (CNRS). While in Paris, Rosalind was taught by Jacques Mering the practical aspects of applying X-ray crystallography to amorphous substances which she used in her research with coal, in particular what happens to the atoms when coal is converted to graphite. She spent four years working for CNRS which she loved. She learned the language and the food, but she especially enjoyed the more egalitarian atmosphere in France compared to the solid English middle-class values which she had grown up with. She felt respected as a scientist, and enjoyed the team spirit at the lab. In 1951, Rosalind was offered a position with the Medical Research Council’s (MRC) Biophysics Unit at King’s College in London. The head of the MRC, John Randall, wanted Rosalind to work on mapping the structure of DNA, since Franklin was the only experienced diffraction researcher at King’s. The existence of DNA had been discovered in 1869 by a Swiss scientist named Johann Friedrich Miescher. By the 1940’s, scientists knew that DNA controlled hereditary but they didn’t hadn’t figured out how it worked. Franklin’s work at King’s got off to a rocky beginning. Maurice Wilkins and Raymond Gosling, a PhD student, had already started working on the project. Using crude equipment, they had obtained a diffraction picture of DNA. However, Randall didn’t tell Wilkins that he had asked Rosalind to take over both the DNA diffraction work and guiding Gosling’s thesis. Wilkins was under the impression that Rosalind was going to be working for him. This created a tense atmosphere at work, particularly since Rosalind was very protective of her work and not inclined to share her discoveries until she was ready. There was also a clash of personalities, Maurice Wilkins was rather shy and reticent, while Rosalind was direct, impatient, confrontational to the point of abrasiveness and had a habit of looking people directly in the eye that Wilkins found unnerving. While she ate with colleagues in the lunch room, Rosalind didn’t go in for the morning and afternoon tea breaks that were common, preferring to spend her time focused on her work. This may have given some people the impression that she was anti-social or not a team-player or at least Wilkins. Meanwhile at Cambridge, an American named James Watson was working with Francis Crick on DNA, but instead of using X-rays, they were trying to the model approach. However, their first attempts were unsuccessful, and their supervisor at Cambridge told them to give it up. Instead of giving it up, they continued to work in secret. In London, Rosalind had discovered that there were two forms of DNA: when wet, DNA was long and thin, and when it dried, it became short and fat. The wet she called “B” and the dry “A.” While Franklin chose to focus on the “A” form, Wilkins began working on “B.” Rosalind was painstaking in her research, and refused to rush to judgment without making sure of her data. By 1952, Rosalind was convinced that both strains were helical in nature. In the beginning of 1953, James Watson had traveled from Cambridge to London to suggest that both teams collaborate before Linus Pauling who was also working on DNA discovered that his proposal for DNA was wrong. Franklin was unimpressed and then became incensed when Watson dared to suggest that she didn’t know how to interpret her own data. Wilkins, who had been drawn by the commotion, sympathized with Watson. Without her permission or knowledge, Wilkins decided to show Watson Photo 51 and some of her other research. Her photo gave Watson and Crick the information that they needed for their model of DNA. Crick’s thesis advisor, Max Perutz, gave him a copy of a report from the MRC that contained many of Franklin’s crystallographic calculations. Rosalind had also prepared a paper that stated her conclusions that DNA was in the shape of a double helix but her paper ended up being published third in the April 25, 1953 issue of Nature magazine. Frustrated by the old boy’s network atmosphere at King’s, Rosalind decided to move on to Birkbeck College to work on RNA structure (a molecule that constitutes the genome of many viruses) and the tobacco mosaic virus (TMV). However she was not allowed to take her research on DNA with her, it had to stay with King’s College. Rosalind Franklin went on to perform exceptional research at Birkbeck College, publishing 17 papers on her findings between 1953 and 1958. She was a senior scientist with her own research group, including Aaron Klug with whom she began a successful collaboration. She died in 1958 of ovarian cancer, at age 37, perhaps from radiation exposure from her work. After her death, there were those who felt that Rosalind’s contributions were downplayed because she was a woman. While sexism may have played a slight role, (Francis Crick admits that they displayed a patronizing attitude towards her) other factors were at play. The race to discover the structure of DNA was quite intense and competitive, a great deal was at stake. There was also the clash of personalities, particularly between Rosalind and Maurice Wilkins. There are others who believe that Rosalind Franklin missed several chances to solve DNA first. Lynne Elkins, a former professor at California State University at East Bay, has made a detailed study of Rosalind and the other participants involved in the quest to solve DNA in the post-war period. Franklin had consulted with another scientist, Dorothy Hodgkin, who was at Oxford University. Unfortunately Hodgkin brushed off Franklin, and sent her to talk to a post-doctoral student at the University. At another point, Wilkins frustrated with Franklin, complained about her to John Randall. He claimed that Franklin had no data because she was no good at making models of molecules. Randall offered to employ another crystallographer, a young woman named Pauline Cowan, to help Franklin out, but in his usual undiplomatic way, he did it behind Franklin’s back. When Franklin found out, she was furious, and rejected the young woman. Elkin believes that Cowan would have been able to interpret Franklin’s data, and predicted the right backbone structure for DNA. Franklin would have been the first to admit that there were gaps in her knowledge, given that most of her work had been with goal. Since her death, Rosalind’s contributions to science as her part in the discovery of the DNA have slowly become better known. In 2003, the Royal Society in the U.K. established the Rosalind Franklin Award for an outstanding contribution to any area of natural science, engineering or technology. In 2004, the Finch University of Health Sciences changed its name to the Rosalind Franklin University of Medicine and Science.